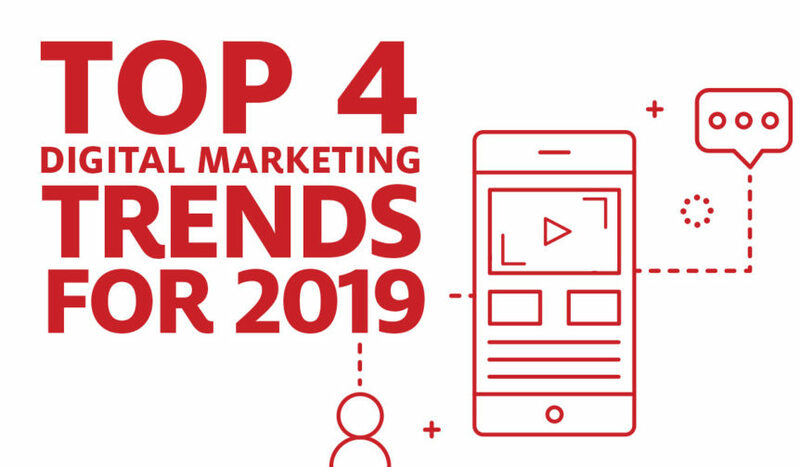 2019 is finally here and it’s time to dive into the digital marketing trends to look out for this year to stay ahead of the competition! Keep your marketing strategies fresh and up-to-date with the latest digital marketing trends and watch your online presence increase along with your sales. As online marketing trends are always changing and evolving, the way to reach your audience must keep up. With video marketing, mobile-optimized content, influencers and personalized marketing content, you are sure to be at the top of your game. Now, let’s take a closer look at each of these trends that are booming in the digital marketing world! First off, video just isn’t optional anymore! 73% of all Americans are on YouTube meaning that you must be thinking of ways to utilize video content in your marketing efforts. Video production is a digital marketing trend that doesn’t seem to be slowing down at all either. In fact, by 2021, 82% of all traffic will be video. Stay in the game by incorporating website video production, social media video, and different types of online video advertising to your advertising strategy. Additionally, there are many different videos to choose from, so you might be wondering what type of video works best for your company as well as questioning the video production costs. Well, we are here to help! At Epic, we prioritize our clients with full transparency, specializing in professional video production to optimize online traffic and increase audience counts. In other words, we got your back from start to finish. Next, another digital marketing trend that continues to be necessary is optimizing your content for mobile devices. Cell phones are increasingly popular which therefore means more and more customers are exploring businesses with the touch of a button. Social media content and email newsletters should all be mobile-optimized. Don’t let poor formatting or broken links stop viewers from engaging with your company! Also, keep in mind that mobile-optimizing is important when integrating video onto your site and platforms. Video advertising needs proper formatting to fit the various online channels. As mobile devices gain popularity, so do vertical videos and shorter length videos, especially on social media. Successful marketing strategies are integrated across platforms and available on all devices. Influencers have always been around in one way or another, but their role in digital marketing services continues to grow at an accelerated rate. The power of word of mouth and recommendations is unmatchable. Plus, it’s hard to obtain organically, so influencers are a way to get your business out there in a more authentic way. Influencer marketing is the best way to reach a large network of people as ‘this network’ has chosen to follow the influencer who is promoting your product or service. Social media platforms and YouTube are where influencers reach the largest audience. Digital marketing is built on communicating through these online platforms. Luckily, that’s what influencers do best. Partner with influencers to make product demo videos, promo videos or to get your products featured on other pages. As a result, this strategy is a sure way to boost traffic. Lastly, the content! Make your digital marketing content specific to your audience in order to really get noticed. Technology is on our side in that it’s becoming easier to connect with your customers. Whether it’s a customized email subject line or targeted ads from past purchases, personalizing your content is a digital marketing trend that will increase peak interest. Personalized content works so well because, in short, customers want to feel heard. There are many strategies available for customizing digital marketing tactics. For instance, digital marketing ad targeting is a great way of tailoring content to specific users. YouTube ad targeting is one of the most effective ways to reach your audience and increase conversion rates. If you’re not sure where to start, Epic is here to not only help create your content, but also get it in front of the right people and increase views. Our digital marketing specialists constantly track online marketing trends to optimize the success of your marketing campaigns. So let’s try out these digital marketing trends in your online advertising strategy. With captivating video optimized for mobile, promoted by influencers and made personal to your audience, you’ll see an increase of viewers and revenue. Epic has many digital marketing services that can help you reach these goals. Though, as the year goes on, the latest digital marketing trends are sure to change. Subscribe to our email list and YouTube channel to stay on top of the latest online marketing trends. Then, meet our team and let’s get started on your next digital marketing strategy!